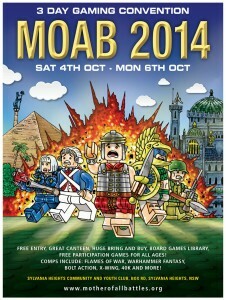 MOAB Gaming Convention is coming to NSW in just a couple weeks. Saturday 4th to Monday 6th October 2014. MOAB, short for Mother Of All Battles, is a three day gaming event held annually over the October long weekend at the Sylvania Heights Community and Youth Club, which is located in the Sutherland Shire, 25km south of Sydney, Australia. Competitions are open for a broad range of games including Warhammer Fantasy and 40K, Flames of War, Field of Glory, Warmachine and Hordes, X-Wing and Bolt Action. There is also a new Board Game Library, participation and demo games, trade stalls, and our popular Bring & Buy which was a feature at last years CanCon. This year we are dedicating the Monday to board games and card games, including free game mastered sessions of Zombicide and Castle Ravenloft, and a Magic the Gathering Khans of Tarkir draft. Presented by The Southern Battle Gamers.